Everyone has favorite museum objects they like to visit — and revisit. But to what items would Pittsburgh museum curators steer visitors in their collections? Here they share their best-kept secrets and hidden gems — the cool stuff they’d take their out-of-town friends to see. One of the most amazing things housed within the Carnegie Museum of Art and Museum of Natural History complex are the walls themselves. Some of the stones chosen by the architects who built this 19th-century Oakland centerpiece have been used to construct cultural buildings since ancient times. Thirty types of stone were used and some traveled a long way to get here — from Algeria, Croatia, France, Greece, Ireland, Italy and Norway, as well as the U.S. They represent three major rock types — igneous, metamorphic and sedimentary — and they preserve the geologic history and events that formed the earth over the last 600 million years, says Carnegie Museum geologist Albert Kollar. Every day, visitors walk by fossils that they probably don’t even notice. The French limestone used in the Paris Opera House Performance Auditorium is the same as that used in the Carnegie’s Grand Staircase Corinthian columns and pillars and Music Hall foyer walls. The fossils embedded in the limestone are the crushed shells of rudists, a type of clam that lived from the Late Jurassic to the Late Cretaceous periods. The Pentelic marble in the Carnegie Hall of Sculpture came from Mt. Pentelikon near Athens, Greece, and is the same kind of marble that was used to build the Acropolis. One of coolest and least known treasures at the Children’s Museum of Pittsburgh is the puppet urSol the Chanter, one of the Mystic wizard characters in the 1982 film “The Dark Crystal.” The character had a singing voice that could calm thunder, stop waterfalls and make stones tremble. The body puppet is made of rubber, papier mache, velour, paint, fabric and hair and was designed by the late Jim Henson and his team for the film. urSol became part of the museum collection in 1985 and now lives in the Attic exhibit area. They aren’t fancy jewelry, but many of us have one of those cool little Heinz pickle pins tucked away in a drawer. They’re now made of plastic. The original 19th-century ones were made from a resin material used by dentists to make fillings. Pictured are early versions: The one on top dates back to 1893 and is one of the oldest surviving pickle pins. They’re part of the Senator John Heinz History Center’s “Heinz” exhibit, which highlights the H.J. Heinz Co. history. H.J. Heinz came up with the pickle pin idea for the 1893 World’s Columbian Exposition in Chicago, which was also known as the Chicago World’s Fair. He hired local boys to hand out cards telling fair-goers to visit the Heinz booth for a free gift. More than one million pins were given away there, making it one of the first and most successful promotional campaigns in U.S. history. The popular pins inspired several spin-offs, including the Heinz ketchup pin and golden-pickle lapel pin. One of the most electrifying attractions at Carnegie Science Center is a vintage invention. The Tesla coil was created in the 19th century by Nikola Tesla, an engineer who made a major impact on history and is known for his pioneering experiments in electricity and X-ray generation. 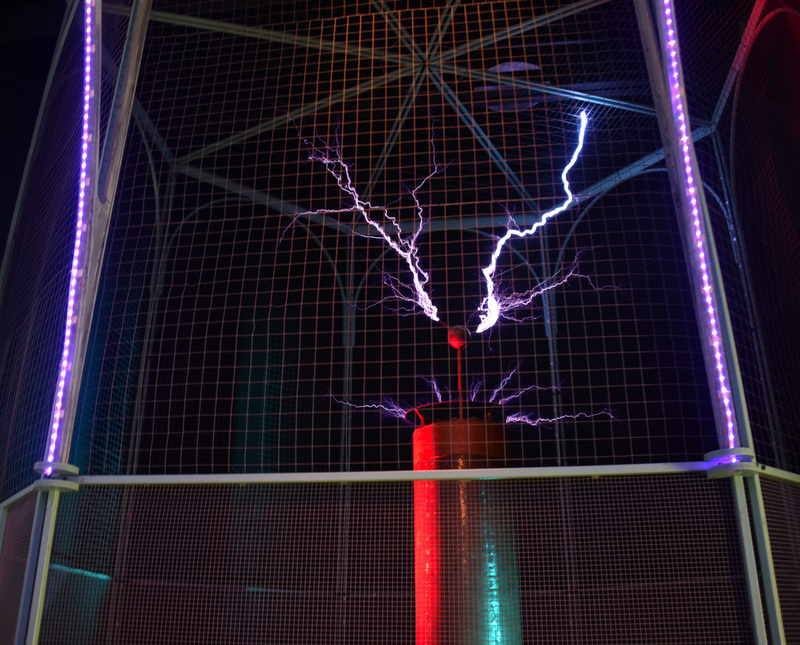 The Tesla coil takes 120-volt alternating current and boosts it to millions of volts, which are discharged as electrical arcs, creating a spectacular display. Mr. Tesla’s dream of wireless electric transmission was never realized, but his experiments with the Tesla coil provided a foundation for several future technologies, with applications in radio transmission, TV picture tubes, robotics and remote control. In 1911, Ben Avon teenager George Kaufman built his own 1.2 million-volt Tesla coil for $125, using 6,000 feet of copper wire. The young scientist was also something of a showman: He’d demonstrate it at local events, dressed in a wild-looking copper suit. He went on to be chief electrical engineer for J&L Steel. His Tesla coil was donated to the former Buhl Planetarium in 1950. It continues to fascinate new generations and is still fired up for demonstrations in the Works Theater.